GOT SOME TIME OFF! (finally) - That means no events are planned for the next couple of weeks, and thanks to Rusch Entertainment for giving a pro DJ some time off during a popular time for weddings. So guess what that means? Now I have an opportunity to focus on something that really makes a difference MARKETING!! and planning for next August 2008! And speaking of 2008, I am excited to announce a number of updates forthcoming. This will include a new web site with more interactive features (calendar, music selections, planning tools, ect), and a brand new "top-of-the-line" light show! 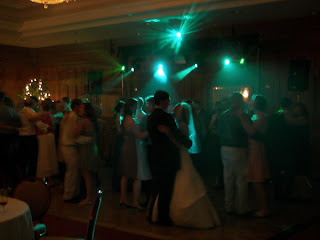 Word of caution - if you are planning a wedding or know someone who is, please do not throw $1500 out the window by hiring any DJ who will act like a drunkin goofball and SING ALONG to songs OVER the microphone (especially if it is off key). Seriously folks this kind of thing really happens. It brings the verse "celebrate good times come on" to a whole new meaning. However if for some insane reason you want that sort of thing at your reception, I will be happy to refer you over to a local agency that offers it. With that said, I am proud to offer a professional, personalized, and ELEGANT entertainment experience. And there are a few things you will NOT see me do at a formal wedding reception. I will not be performing while sitting down. I will not have my back to the audience or be shuffling through CD's. And I certainly will NOT be singing over the microphone during songs. Clients can rest assured knowing they will not be embarrassed in front of their guests. Hope you are having a great summer. Thanks for reading friends.